Previously, I have talked about standing still and just being content. I am finding this so very helpful when working with horses. I simple stand still, close my eyes, imagine all my “energy” close around me, and then I simple listen to things around me. I also take time to feel the wind or sun on my skin. I try to focus on these things and not on the horse. I try to imagine a great sense of peace and joy. If I want to be magnetic to the horse, I imagine that I have to be content with myself. I find I am relaxed and happy when I close my eyes and simple feel what is doing on around me. Yesterday I worked with one of my horses. He is just green broke. I am just training him under saddle to sell. I have not done any liberty work with him. He tends to move with his head up and just race around. So I was free lunging him in the round pen and I just wanted to do a few walk/trot/walk transitions to see if he would calm down. I asked him to trot off. I did this by using just the tip of the lead rope and my body language. I wanted to try to communicate to him that I wanted him to softly go away. Early on, he would rush off, but as I got better at controlling my body, he started to just walk off when I asked him. Then I would ask him to trot and off he would go. I only asked for one circle before I tried to find that calm. I closed my eyes and concentrated on the wind moving on my arm (70 degrees in the sun!) and the sun on my face. I distantly knew that the horse was coming towards me, but he startled me by coming and bumping my arm. This horse is not super concerned with what people are doing. He is not scared, but he would rather be with the other horses. So to have him come up and want to be with me was pretty amazing! He then would follow me around. I proceeded to do this quite a few times. I would ask him to walk off or trot off and after just a circle or so. I would relax and focus on myself and he would come trotting up, stop, and stand by me. It was an amazing feeling. It just reinforced this idea of being the calm in the storm. 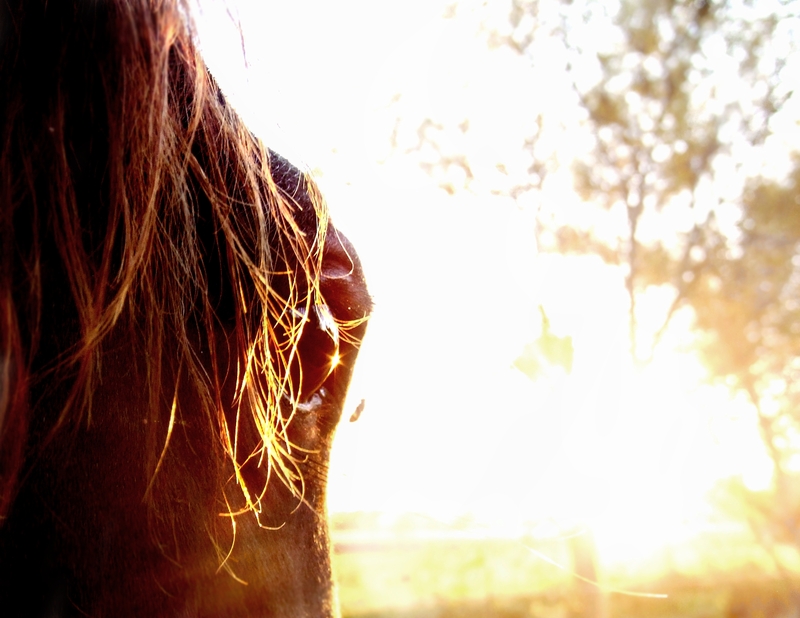 If I want my horse to desire to be with me, must I not be someone who is content and happy without my horse? I need to be so content with myself that it shows through to my horse. I cannot be so desperate for my horse to love me that I seem clingy. My horse must be able to feel as comfortable with me as away from me. So practice focusing on things other than your horse. Spend five minutes near your horse, but do not look at him or think about him. Instead, focus on the wind, the snow falling, the leaves rustling, the birds singing, or the clouds moving. Feel the life around you, put there by our Creator, and be content. « Fun horse Liberty Video! This is one of my favorite posts you’ve written! What a beautiful concept, and one I will try with my own horses. Thanks, Ivy!